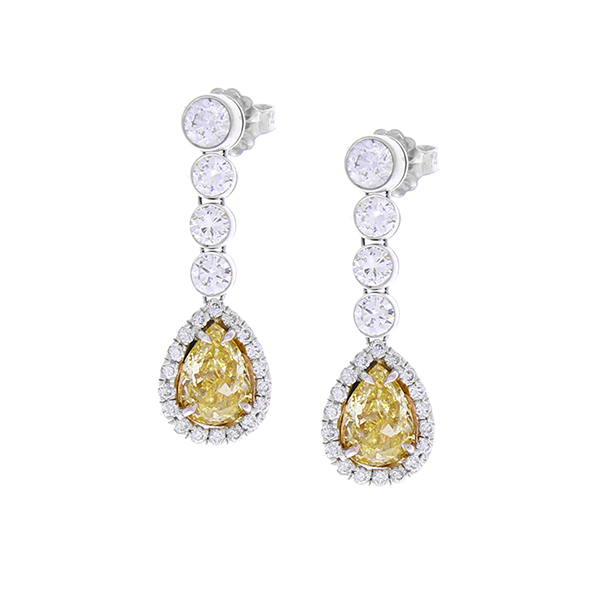 These luxurious diamond drop earrings are absolutely breathtaking! They feature dazzling white diamonds set in a linear design that drop down to illuminating pear shaped natural fancy yellow diamond centers. The fancy yellow diamonds are lemon yellow in color and total 2.09 carat. A dazzling halo of brilliant diamonds dance around the yellow drops bringing the total weight of the white diamonds to 1.10 carat. The contrast is perfect. The gemstones are set in sleek 18 Karat white gold and attach to the ear with 14 Karat white gold backs.